The purpose of this blog post is to share my experience in my over 22 years in the Information Technology (IT) industry. The goal is elicit readers to ask themselves what they are willing to do to be successful through better career management. When I think of career management and how to better explain it in simple terms, all I can think of is a recipe. A recipe is the outcome or end state that is an amalgamation of all of the ingredients. So, I’m calling this blog post a recipe for success. I’ll try identifying and explaining the different ingredients that I learned along the way. What are the ingredients for the recipe for success? 1) Discipline – this is in my mind the most important ingredient. Discipline is an orderly pattern of behavior in which we have a self control over how we want to conduct ourselves. This starts by understanding your core values and making decisions based on how it aligns to your core values. 2) Work hard – making sure that you earn the day’s pay is an important concept. It meant making sure that you’re doing the right thing and working and not spending time on things unrelated to your work. It is putting forth your best effort at all times no matter if you want the work or not. It is important to learn that there should be no work beneath us. Because if we start thinking that we are better than the work we are asked to do, we’ll stop being an effective team player. 3) Integrity – be authentic and be accountable for your actions. Commit to doing the right thing regardless if anyone is watching. Ensure that your actions are in alignment with your core values. 4) Be positive – no matter how hard the challenge that you face. Don’t let it wear you down, and keep on pushing forward. Focus on the positive side of every situation. By doing so, you’ll see things differently. 5) Be Proactive – means that you show initiative to want to do more if you have some bandwidth. Also, it means that you ask for more work, assuming you completed your work ahead of time. Seek to learn new things in order to help you grow. 6) Team player – remember that in order for you to be successful, everyone working on the project also needs to get their job done. If you have bandwidth, offer your time to help others. One person cannot do it alone, teamwork is necessary to get the job done. 7) Plan – if you don’t have a plan, you’ll be working for someone else’s plan. Also you would not know if you’re on track or not. Make a plan, work based on your plan and track and adjust your plan accordingly. 8) Network – connect with others and establish a good relationship. The relationship established will go a long way. Make sure that every interaction you have is a positive one. Respect others and demonstrate that you care about the people around you. Focus on making a meaningful connection beyond just being connected on Twitter and LinkedIn. Reach out to them and connect and interact with the people on your network. 9) Mentor – seek mentors who can help you accelerate your learning. Also, pay it forward and mentor others in your organization and community. 10) Embrace the change – change, like death and taxes, is certain to happen. In fact, change is expected to happen and your ability to adapt to change is crucial to your success. 11) Play – as you work hard it is important to realize that you also need to enjoy and relax and unwind. You need to recharge to enable you to sustain your performance. Just like an engine, it needs maintenance to keep it running smoothly. Determine when to take that downtime to refresh and help you refocus. 12) Learn something new – there is a saying that you cannot do business tomorrow with the same tools you use today. Commit to continuous improvement by learning new things over time. Sharpening your saw is essential to your success. 13) Focus on long-term results – instant gratification brought about a whole set of problems as exhibited in the financial industry. Greed took over and a lot of short-sighted decisions were made that caused the economic downfall. When we map out our career plan, we need to focus on the long term goals (between 3 to 5 years) and devise a plan to accomplish that goal. 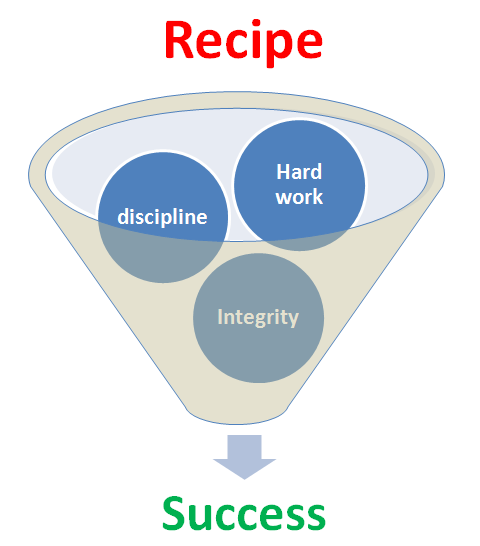 In my opinion, the top five ingredients are integrity, discipline, being proactive, working hard and passion. The other ingredients can be added accordingly. It is worth noting that our career is a marathon, or perhaps an ultra marathon, and not a sprint. Therefore we need to be able to sustain a level of performance over time. Consistency and commitment to continuously developing and retooling your skills will help you attain your goal. Do not lose sight of your career goal and dream. Our dream is the target that we need to focus on. Focus on chasing your dream and making it happen. In closing, think long term and act swiftly and make things happen. Its like you read my mind! You appear to know so much about this, like you wrote the book in it or something. I think that you can do with a few pics to drive the message home a bit, but other than that, this is magnificent blog. A fantastic read. I’ll definitely be back. I prepared a presentation using this content for use with the Year Up intern at our company. Thanks for your kind words. Hmm Well I was just searching on yahoo and just came across your site, in general I just only visit sites and retrieve my required info but this time the useful information that you posted in this post urged me to post here and appreciate your diligent work. I just bookmarked your site. Thank you again. I wish I had developed these traits earlier in my career! Thanks, I hope to continue to share my knowledge and experience to help others develop and grow.